Why Don't You Put "pea" Brain People As Your Eco-Tourism Attraction? 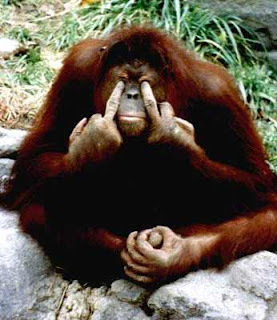 Angry Orang-Utan on the "issue"
KOTA KINABALU: Sabah is not keen to relocate any orang utan to Peninsular Malaysia for eco-tourism purposes. State Tourism, Culture and Environment Minister Datuk Masidi Manjun said not only is it dangerous to remove the sensitive primates from their natural habitat but the local people were against such a move to send the state’s icon away. He said this when commenting on a statement by Deputy Tourism Minister Datuk James Dawos Mamit, who said they would obtain orang utan from Sabah and Sarawak to set up an eco-tourism attraction similar to the Sepilok orang utan sanctuary in Sandakan and the Semenggoh Wildlife Centre in Kuching. Mamit had told reporters in Kuching on Sunday that Prime Minister Datuk Seri Najib Tun Razak had requested for some orang utan to be sent to Peninsular Malaysia to promote eco-tourism. Masidi said yesterday orang utan were not like some other animals that could be easily relocated from their habitat. He said any relocation could be traumatising enough to cause their death. He said relocating an orang utan involved a lot of technicalities and planning. “The orang utan should stay where they are.Those who want to see orang utan will have to come to Sabah to see them,” Masidi said adding that there had been no official request made to the state government for the primate. Like some folks says here in Sabah, because they don't have real history, so "buatlah sejarah sendiri". Thats' funny to hear. For all Sabahan, put this message on your facebook (for those who have facebook account) if you truly Sabahan.. this is a campaign. "say "NO" to relocation of our precious Orang Utans to Peninsular Malaysia to promote their so-called eco-tourism. They've bled us out of our timbers and other resources making us the poorest state in Malaysia. Copy and Paste this message if you are truly a SABAHAN!!"